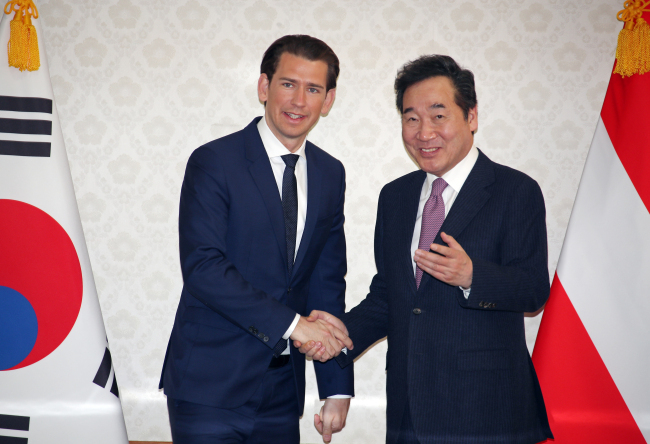 South Korean Prime Minister Lee Nak-yon on Thursday expressed his gratitude for Austria's support for the peace process on the Korean Peninsula in his meeting with Austrian Chancellor Sebastian Kurz. "I explained to Kurz that the Korean Peninsula is heading towards to a future of peace," Lee said in a joint press conference with Kurz. "Chancellor Kurz also promised to cooperate with the international community to support the denuclearization of North Korea and the implementation of peace on the Korean Peninsula." In their meeting, Lee and Kurz signed a memorandum of understanding (MOU) on science and technology cooperation and vowed to expand human resource exchanges in the areas of information and communication technology and e-government. "Austria and South Korea are ideal partners in the era of the fourth industrial revolution," Lee said. "We will work harder to have a 'win-win' economic partnership and help Austria to expand its investment in South Korea." Lee emphasized that Austria is a powerhouse in fundamental science that has produced more than 20 Nobel prize winners and is a home for world-class small and medium-sized enterprises. Lee also asked Kurz to support South Korean businesses in Austria and promised to expend more efforts to increase trade. Kurtz responded by saying that Austria wants to establish a leading status in the 5G industry in Europe by working with South Korea and is looking for further cooperation in the digitalization, artificial intelligence and autonomous driving sectors. This was the second meeting between Lee and Kurz. The two previously met in Vienna, Austria, in May 2018. Before his meeting Lee, Kurz held talks with South Korean President Moon Jae-in and discussed ways to improve their countries' bilateral ties. The Austrian leader will leave the country Friday.